Stop and Frisk. I’m sure you’ve heard about it but I doubt you’ve personally experienced it or really even thought about how it would feel. Imagine you’re walking in your neighborhood, hanging out in a park, just talking to your friends. All of a sudden a police officer walks up and informs you he needs to pat you down and search you right where you stand. If he doesn’t find anything illegal on you, you can go back and continue doing what you were doing. If he does find something illegal, you’ll be arrested on the spot. Why can the police officer do this? If you’re in New York: because you were acting “suspicious”. That’s it, no other reason is necessary for an officer to invade your privacy and put you through such a traumatizing and humiliating experience. I know there is a time and a place for stopping and frisking a suspect, but I think the New York policy goes too far and oversteps the boundaries of what stop and frisk should be. New York law says police can stop and frisk any person they observe with “furtive” movements or “suspicious” behavior in order to reduce crime and gun usage in an area. This means a person can essentially be stopped anywhere anytime in the city. Needless to say this leaves a lot of power and discretion with individual policemen, making it much too easy for an officer to abuse this policy and indiscriminately stop people. Or worse to start stopping people based on their race instead of on their behavior. It is this racial problem more than anything that has led to outrage and protests in New York City, which culminated in a march on Father’s Day of several thousand demonstrators. People feel that the police unfairly target minorities to the point that they have created a feeling of martial law in some areas of the city. And with the way the policy has been implemented, they’re right. Mayor Bloomberg of course denies that police officers use racial profiling when they exercise their right to stop and frisk. I’m sure the mayor and most of the officers really do believe that when they say it. But it is essentially impossible to guarantee that race doesn’t play into their decision making on some level. Even if an officer is not consciously racist, psychological studies have shown that many people still have an unconscious bias against minorities. Which means that a law like New York’s stop and frisk will inevitably result in racial disparities in stoppage rates. When police have to work on off of “hunches” and don’t have to provide evidence for their suspicions then they can do whatever they wish and allow all their potential prejudices to influence them. The law needs to be reworked so that is no longer the case. People should not be at a greater risk of attracting police attention just because of their race. It isn’t fair to them and violates their rights as residents of this country. Stop and frisk hasn’t proved to be particularly effective, with only 10% of stops resulting in arrests or summons. So there is no reason to continue implementing a policy that does at least as much harm as good. Why not turn to other more effective methods of gun control instead? The state could put more money into educational programing for kids. Or copy Illinois and Washington and introduce more transparency in the policing system to restore people’s faith in the police department. It would be better for everyone to implement a system that encourages people to support and work with the police rather than one that creates animosity and distrust. Of course officers should continue to have the ability to pat down a suspect if they have a legitimate cause. But this should be used as a method to protect themselves not as gun control. New York City has a responsibility to protect all its citizens and their rights and their policies should reflect that. 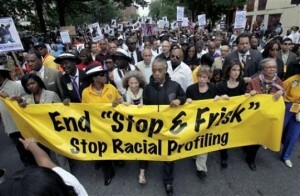 Stop and frisk should be fixed so that EVERYONE is safe and treated equally. Elisabeth Arnold is a senior at the University of Pennsylvania majoring in political science with a focus in American Politics and with a minor in Chinese. In her coursework, she has specialized in social movements, policy analysis, and legal studies. Elisabeth is a Program and Research Intern with the SISGI Group focused on US race relations and incarceration, women’s rights, and US immigration policy.